The scientists analyzed data spanning more than four decades, from 1972-2017, and concluded that the impact of lake trout in Yellowstone Lake—in particular, the decline of native cutthroat trout—has cascaded across the lake, its tributaries and the surrounding ecosystem. 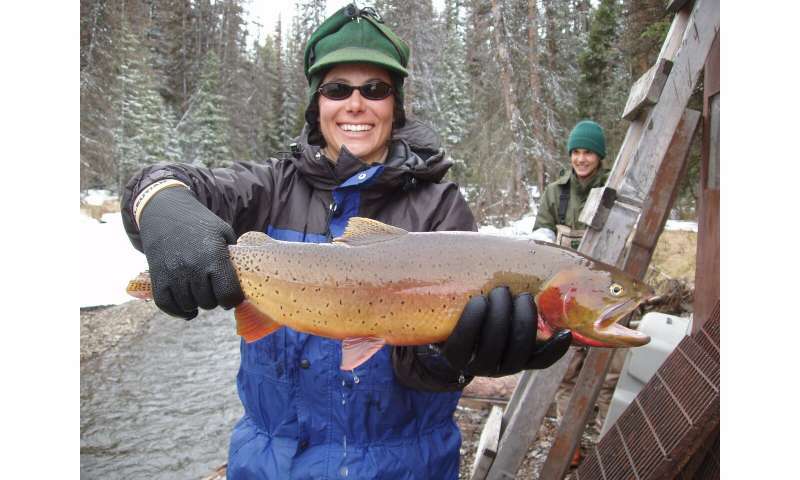 Monitoring over the past three decades has shown a dramatic drop in the numbers of native cutthroat trout that inhabit Yellowstone Lake and spawn in its tributaries, largely as a result of the illegal introduction in the 1980s of lake trout—which prey on cutthroats and spawn at depths inaccessible to bears, birds and other animals. Bald eagles shifted their diet to compensate for the loss of cutthroat trout. Even with that shift in diet, the average number of bald eagle nests on Yellowstone Lake dropped from 11 in 2004-2008 to eight in 2013-2017. And nesting success dropped from 56 percent in 1985-1989 to zero in 2009, rebounding to 70 percent during 2013-2017 as the eagles found alternative food sources.Bald eagles at Yellowstone Lake have been seen more frequently preying on common loons, trumpeter swan cygnets and young white pelicans, possibly contributing to declines in those bird numbers as well. Otters, which relied on cutthroat trout as a primary food source, have shifted their diets to longnose suckers and amphibians. While there are no estimates on otter numbers in Yellowstone Lake and its tributaries before the introduction of lake trout, the estimate in 2008—one otter for every eight miles of shoreline—is among the lowest ever reported for a river otter population. The researchers say the reintroduction of wolves to Yellowstone starting in 1995—the year following the discovery of lake trout in Yellowstone Lake—did not play a role in the shift in diet for bears in the Yellowstone Lake area. While grizzlies prey upon elk calves primarily during the first few days after birth, wolves and other predators kill elk calves later in the summer and winter. All because people wanted to have fun torturing/killing fishes. It's truly tragic that so many people have yet to evolve beyond that. Fishing is cruel and environmentally reckless. There's nothing sporting about it. The fish are victims not willing participants. It isn't sport it's animal abuse.